Oracle introduced the notion of whitelisting in Java 7 update 40. It was called Deployment Rule Set. In Java update 51, it introduced a new feature, that was close to whitelisting as well, but very different. It was called Exception Site List. In this post, we are going to make clear the differences and introduce a new tool we have just developed, that may be seen like some kind of Java firewall. It is called JavaRuleSetter. Compile it with Java (you would need the JDK). Copy it to a standard place in the system. The result was that, when visiting a web page with an applet, this is the decision tree Java follows to run it or not. The rule may block it completely, or allow but only if digitally signed properly. The applet is run without prompts. If set to "default", it goes to the exception lists decision tree. That was really hard for an administrator and even impossible to achieve for a standard user, so Java reacted creating the Exception Site List. But Rule Sets may very well be used by single users, not only administrators. This is one of the reasons we have just created this tool. To simplify creation of rules for advanced users, and, for creating the whole system for less savvy users (create a certificate, sign it, etc). This was created in January 2014 (just months after Deployment rules) for users. It does not require administrative privileges and it is all done via Java interface. It may be seen as a second way to whitelist, but not as powerful as Rule Sets, and as a first layer of defense for a single user. For creating an Exception List, just run javaclp.exe and add a domain. It will work one way or another depending on the Java security configuration. 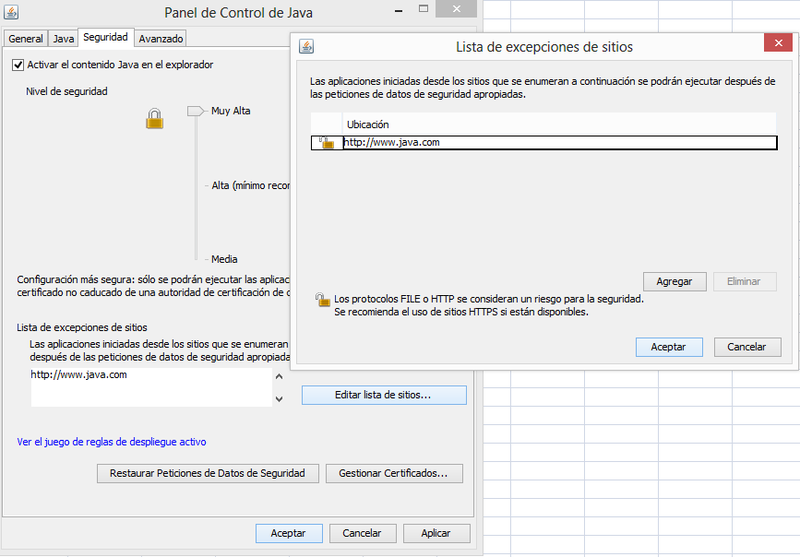 The file controlling the Exception Site List is stored in the user’s deployment location C:\Users\username\AppData\LocalLow\Sun\Java\Deployment\security\exception.sites in Windows. Rule Sets allows to create a rule set and distribute to several computers. It wins over Exception Site Lists in case of conflict, and may be modified just by an administrator (not by the user). Another interesting thing is that Rule Sets works on a very early stage. If some day, security levels are defeated, exception site lists would be bypassed, but not the rule sets. Java is complicated right now. 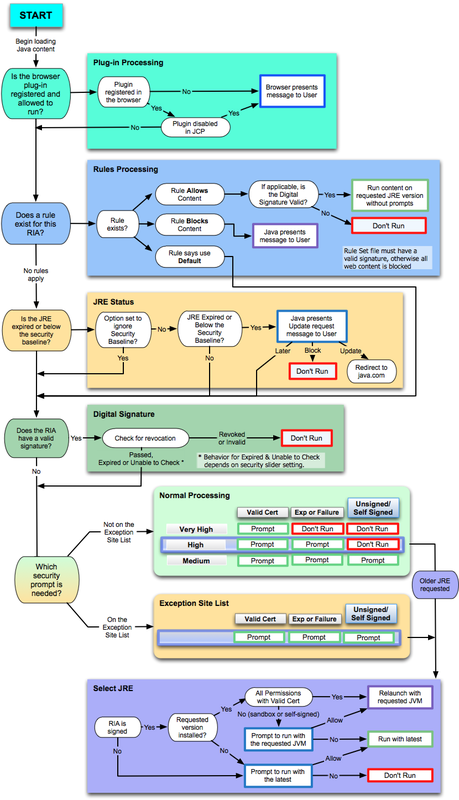 This is the decision flow when executing and applet (or RIA, in general). This is the best way to understand how security has improved in just two years. 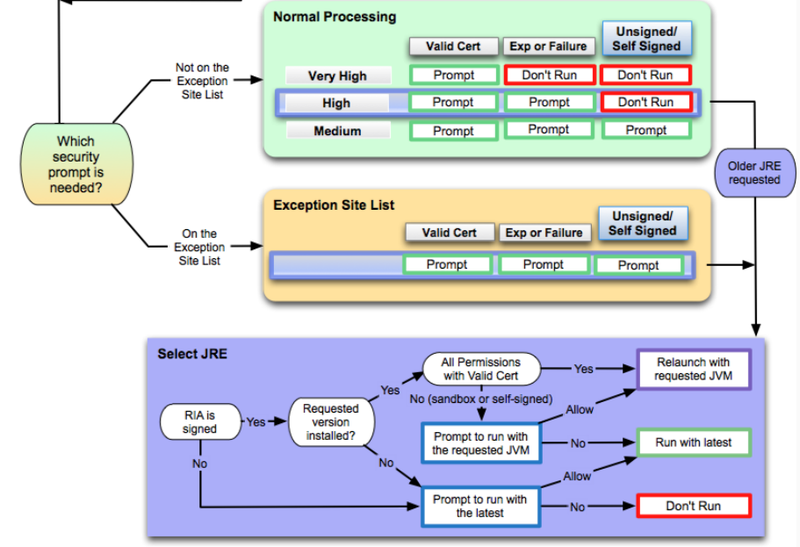 The complete flow of Java applets executing or not depending on JRE version, Deployment Rules, Exception Lists, etc, is this. Deployment rules work on the second level from start, and Exception lists work on the fifth level. Java Rule Setter is intended for users that are really worried about Java security (they all should) and have to work with it (if you don't, just uninstall it from the browser). If you have no idea of what you are doing, just add a domain you need Java to run and click on "Apply changes". The program will create default settings and apply them. If you are a savvy user, you can use your usual keystore and sign the Deployment Rule file, and skip the whole process. Click on "Advanced mode" for more information. There is very basic way to use it. Just run it and add a rule with a domain you want to have in your whitelist (wildcards supported). Click on "Block everything else" and apply changes. You will need to elevate privileges twice: one for adding a cert (only the first time) and one for copying the Rule Set file to system32. The tool works in GNU/Linux and Mac OS X, although it has not been fully tested in those platforms. We have created two versions, for Java 8 and Java 7. This tool is in alpha version, so it may contain some bugs. Please report so we can fix them. More information and instructions are available here.